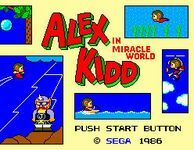 Sega Vintage Collection: Alex Kid & Co.
Alex Kidd in Miracle World is primarily a platform game, which also incorporates strategy and roleplaying. The player must finish levels and overcome obstacles and scenarios in a 2D atmosphere. Throughout the eleven stages of Alex Kidd in Miracle World, Alex Kidd faces many monsters, plus the three henchmen of Janken the Great, before facing Janken himself. Source: Wikipedia, "http://en.wikipedia.org/wiki/Alex_Kidd_in_Miracle_World," available under the CC-BY-SA License.